This writer came into Siem Reap, Cambodia all prepared to hate tuk-tuk drivers. After all, how different could they be from the aggressive, persistent moto touts I came to detest in Hue, Vietnam – the ones who couldn’t take no for an answer and seemed to take umbrage even at gentle rejection? But in this case, increasing familiarity bred affection. The laid-back Khmers, in contrast to their more hard-charging Vietnamese counterparts, manage the difficult business of getting customers by mixing persistence with (it seemed to me) acceptance and cheer. And when I got a tuk-tuk contact of my own to take me to the Angkor temples and later to the Siem Reap International Airport, I was impressed by Mr. Phinn’s reliability and his optimistic outlook. I’ll admit, Mr. Phinn won me over, but in case you can’t find a tuk-tuk driver of his caliber when visiting Siem Reap, here are four tips to make tuk-tuk rides an easier, happier process for you. Agree on a price before boarding the tuk-tuk. Locals and old Cambodia hands already know the fair price for the desired distance, so they generally don’t haggle the fare before boarding. New arrivals do not have that luxury, and tuk-tuk drivers will not be shy about complaining if they feel short-changed. Tell them the landmark, not the street name. tuk-tuk drivers are nothing like London cab drivers with their grasp of “the knowledge” – many of the former are actually newish immigrants to the city just trying to make a living. So their grasp of street numbers and names may not be as good as you like, and they might not be able to understand written (Latin alphabet) instructions either. On the other hand, the tuk-tuk driver will likely know the temples or markets close to your stop. So tell them you’re going somewhere near, say, the Old Market, navigate from there, and you’ll have better luck getting to your destination. Those queues of tuk-tuk drivers waiting for riders? Avoid them if you can. 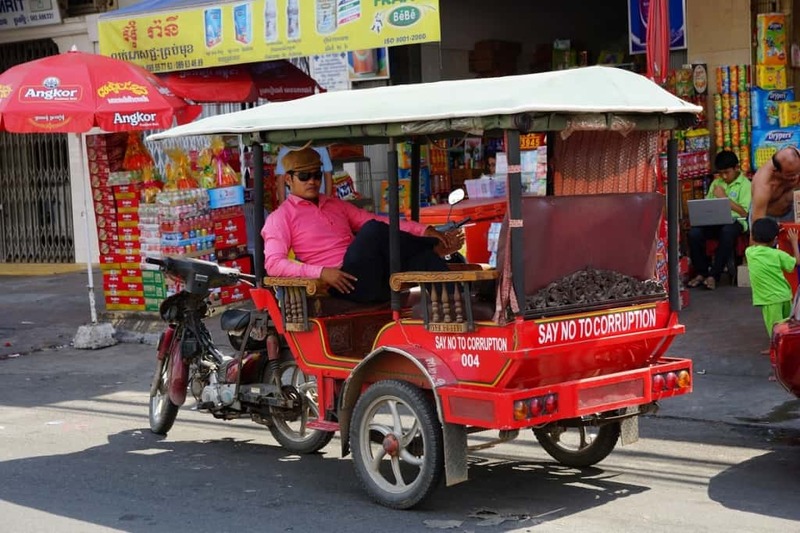 Tuk-tuk drivers who have just disgorged passengers, or those you catch already driving on the road – those will likely charge less than the tuk-tuks waiting in front of luxury hotels, restaurants or shopping areas. Rule of thumb is – if you can get the tuk-tuk yourself instead of relying on the hotel reception or the ready-made queue, you can save yourself a bit of change over time. Mind your belongings. The tuk-tuks’ wide-open layout puts its riders at a heightened risk of snatching by opportunistic thieves, either by nimble fingers who strike when you’re momentarily stopped, or by thieving men on motorcycles. Keep your fancy smartphones hidden when riding in a tuk-tuk, and secure your belongings under your legs on in your arms when on the road. About the tuk-tuk driver I mentioned at the outset: Mr. Phinn provides tuk-tuk services for the Angkor temples and around Siem Reap, including airport pick-up and drop-off. He serves free bottled water for guests of his Angkor temple tours, too! Call him at +855 12 97 52 48 or email him at mr.phinn@yahoo.com. He’s the guy who looks like an older, Khmer version of Ian Wright.